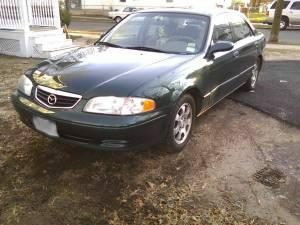 After moving to NOLA, I conceded to bicycle commuting in order to save on insurance and upkeep costs, so I sold my first car—the one that practically housed me throughout university. Green commuting in NOLA is actually much easier than tolerating traffic. Everything essential is within walking or biking distance. You keep your body in a relatively decent shape since you’re self-powering your vehicle, though I somewhat feel the flat geography of NOLA is cheating in that regard. However, in spite of the afore-mentioned traffic, I can cross town faster on bicycle, and not have to worry about parking problems. It changes the way you envision your daily routines, errands, and activities. It also gives you the opportunity to slow down and truly experience your neighbourhood. I doubt I’d appreciate the cultural architecture of the south nearly as well if I drove past these houses at 30+mph every day. One worry as a bicycle commuter is the abundance of thieves. Last March, one actually pedalled away with my bike, right before my eyes. The cheap lock was clipped off, just out of sight from where I sat at the steps of the building by the square. I was there for the free concert, having a good time. Suddenly, I spotted somene riding past on a bike that looked suspiciously like my own. I glanced over where my bike was parked (and now missing), then chased after the thief. But he turned a corner, and I lost him as a crowd of people swarmed me. A pit filled my stomach as I watched my bicycle exit my life. Nothing gets you down more than having your sole means of travel stolen in front of you. A dozen thoughts crossed my mind in that moment, most memories of all the adventures I had with that bicycle. Welcome to city-life, I thought, suddenly despising its convenience and missing rural-suburbia. With just a part-time job of embarrassing income, I couldn’t afford to replace my bicycle. Worse, any savings toward a new one would have to be budgeted for bus fare. I filed a report with the police. The offier was kind enough, but I could tell from his tone of voice that they didn’t have the resources to recover yet another stolen bicycle. Social media became my knight in shining armour. I posted everywhere I could think of, and a few days later received a response from Craigslist. 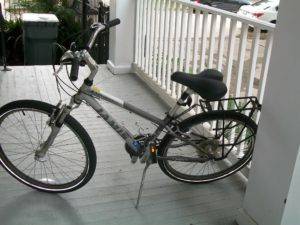 Someone purchased my bicycle and offered to return it to me! I melted in surprise when I saw the bike chained to a post in the French Quarter. Indeed, it was mine. It crossed my mind that the guy who found it simply wanted to collect reward money for the return. But he didn’t ask for anything, and seemed satisfied by my relief. I offered him a couple of $20s. If it was a scam, this was nothing compared to the cost of replacing a $400 frame. My first stop was to GNO Cyclery. I couldn’t afford a full tune-up, but they offered a quick check for any malicious issues that could’ve happened while my frame was missing. No severe damage had been done, but they tweaked the gears and filled the tires. That same night, I went online and discovered several ways to be more protective of my bicycle, especially as I plan to live in cities for the foreseeable future. I invested in a u-lock, took photos of my bike, and uploaded all the information to both a local and national bicycle registry. These services offer proof of your ownership through a record of the frame’s serial number. One even has a QR sticker you can place on the frame as ID. If you ever find a bike you suspect is stolen, if it has this sticker you can scan it and check the registry. The police failed to tell me that, without the above information, chances of my recovering my bike were already slim. If they’re lucky enough to find the bike, they need to know you can prove its yours. I recommend any city cyclists (or even suburban/rural ones because you never know) to take advantage of technology in this matter. Precautions are better than being stranded. Tagged city life, cycling, nola, wisdom.